In 1814, Napoleon nationalised the cultivation and sale of tobacco in France and it was at this time the Burrus family, who were winemakers from Dambach-la-Ville, fled Alsace and settled just on the border at Boncourt. As a farmer, Martin Burrus (1775-1830) first sold rolls of tobacco made by hand and smuggled them across the border. He founded a tobacco business which would grow further under his son François-Joseph Burrus (1805-1879) who succeeded him in 1828 and went on to build a tobacco factory in 1850. 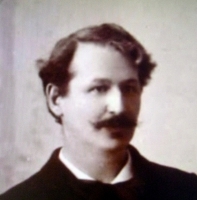 Martin Burrus’ two sons, Joseph (1838-1921) and François (1844-1915) would continue to grow their father’s business, by 1882 the Federal Bureau of manufactures and trademark records the François-Joseph Burrus brand. In 1894 the tobacco factory was connected to the telephone network and a project was underway to connect it to the rail network. 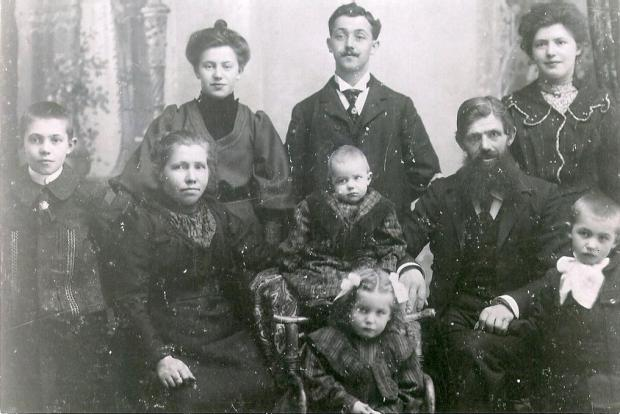 The Burrus family always practised a paternalistic management towards their employees, by providing benefits that the law did not give them (insurance and retirement from the interwar period) and they also demonstrated their generosity to the Boncourt community by providing a football stadium, swimming pool and homes for the elderly. 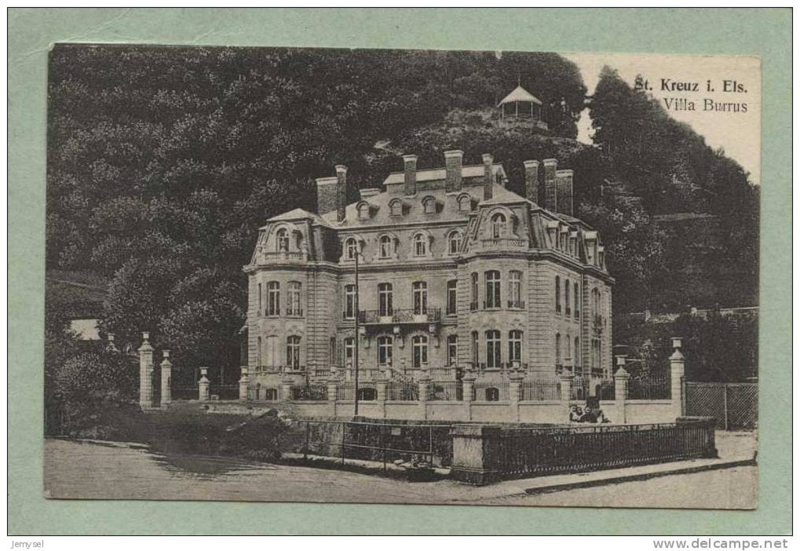 In 1900 the Strasbourg architects Gottfried Julius Berninger and Gustave Henri Krafft designed a chateau for the tobacco factory owners Jules Burrus and his wife Hermance Hélabert to be built next to the Saint-Nicolas church. The building was set with a large gate at its entrance and fenced in equally beautiful metalwork manufactured by the locksmith Leo Feist in Strasbourg. The smelter Val d’Osne created decorative urns to be placed on columns that supported the gate and fencing. Internal decoration by many skilled craftsmen and artists would see stained glass by Camissar, sculpture by Riegger, ironwork by L. Feist and dining furniture by Erhard-Friese. The Burrus residence was to be known as Chateau Burrus. 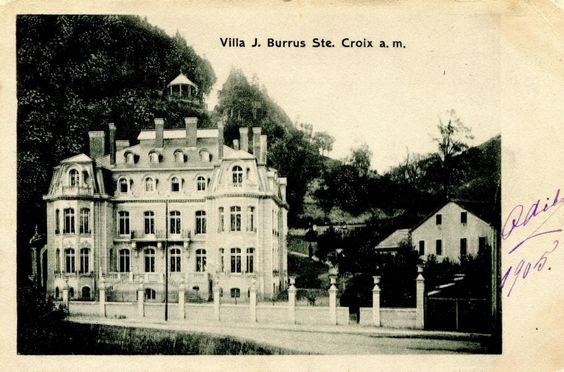 In 1911 Maurice Burrus inherited the Chateau, when his father died, and settled there. Maurice Burrus was born in Sainte-Croix-aux-Mines on March 8, 1882. He was educated at Dole, then at the Collège Stanislas in Paris. He moved to Hannover in order to learn the German language and banking practice. His stamp collection was considered one of the greatest ever assembled and included some of the world’s rarest stamps. The “Bordeaux Cover”, bought in 1934 by Burrus at the Hind auction, with Mauritius 1d Orange-red and the 2d Deep Blue “Post Office” stamps. Auctioned for CHF 5,750,000 in 1993 by David Feldman. The “Bordeaux Cover”, bought in 1934 by Burrus at the Hind auction, with Mauritius 1d Orange-red and the 2d Deep Blue “Post Office” stamps. Auctioned for CHF 5,750,000 in 1993 by David Feldman.Burrus began to collect stamps at the age of seven after old family mail found in their attics spurred his interest. He owned some of the rarest and most expensive stamps known, such as the 1886 Dominican 6 pence Queen Victoria stamp with a “one penny” overprint error and an 1851 New Carlisle Postmaster’s Provisional on cover. In 1911, André Burrus built his residence at No. 4, Station Street in Sainte Croix aux Mines, as a wedding gift to his new wife Marie Marguerite. 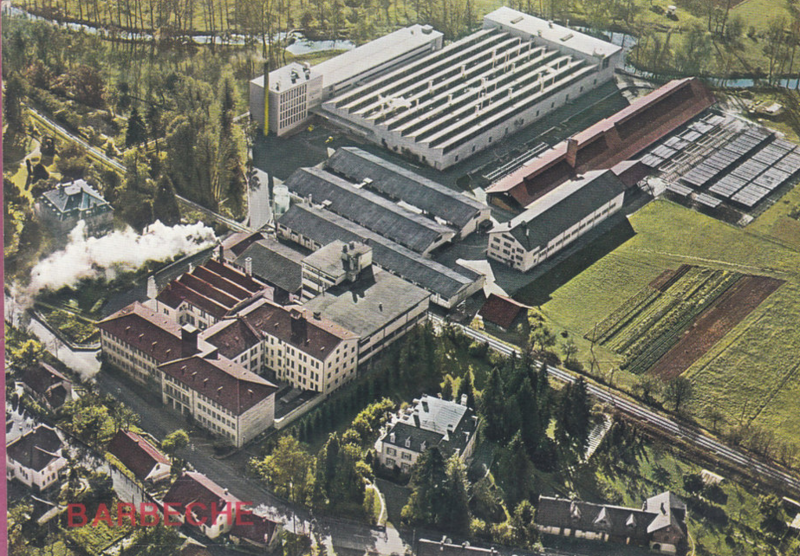 It was in this year that Maurice Burrus and his cousin André, took the reins of the tobacco factory in Sainte-Croix-aux-Mines, which was already the largest in Alsace. Maurice André shared the tasks: with André more concerned with the technical aspects, and Maurice supporting the commercial sector, including the purchase and trading of tobacco. Maurice held a love of travel and discovery travelled, visiting much if of the world including Asia Minor, Canada, the United States. On a trip to Corfu, Greece, he developed a passion for archaeology and went on to follow in the footsteps of Heinrich Schliemann to discover the ancient ruins of Troy. The harmonious coexistence of international training and Alsatian artistic context is reflected in the work of these two natives of Strasbourg. The First World War saw Maurice spend eight months behind bars in Colmar and Mulhouse, for “manifestation of anti-German sentiment”. The industrialist had been forced to house German officers at the castle. In 1916, in a letter written to his sister living in Switzerland, Maurice Burrus described a German officer as “wild”, writing about the mess left after a well-watered party. The letter was intercepted and ended in a prison sentence for Maurice, who lost 30lbs during his stay. His home in Sainte-Croix-aux-Mines was requisitioned by the German General Staff, for refusing to provide German soldiers in tobacco, he took refuge in Switzerland when he was called up for service. At the beginning of the war he spent time searching for the French wounded by the German forces. 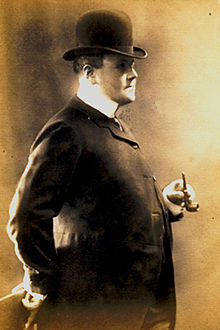 After the armistice of 1918, Maurice Burrus takes over the management of the tobacco factory which the French state, as nationalisation required, became the sole client. During this time the same time, it provided multiple subsidies to associations that built homes in France and abroad, bought the famous forest of Saou in Drôme, where Maurice notably build a replica of the Petit Trianon at Versailles. Maurice was decorated with the Military Cross and the Medal of Loyalty, at this time he founded the Association of Exiles in Alsace, bringing together all those who have expressed anti-German sentiments. Five years later a plaque in tribute “to the victims of barbarity German” is affixed on the front of the local school of Sainte-Croix-aux-Mines. Maurice became an Influential figure, adding to his duties at the factory management of the bank of the Rhine. In 1923, he founded the financial cap company Esca in Strasbourg, which he presided until his death. At this time he sponsored the archaeological excavations and restoration of the ancient sites in Vaison-la-Romaine. Maurice Burrus was elected into the French parliament in 1936 and he has been credited with his influence on Daladier to speed up the digging of the tunnel of Sainte-Marie-aux-Mines which opened in 1937. To celebrate the opening he invited 800 people to lunch and had a huge tunnel chocolate made to divide between the 2,000 children in the town. During World War II, Maurice was forced to flee and take refuge with his brother, Fernand Burrus at Lyon who gave him a car for a discrete escape to the Pyrenees where he owned property. His home was converted into a training center for injured German officers to become senior Reich. His financial support to the French army lead him to be decorated with the Croix de Guerre in 1945. After the war, he was suspected of collaboration with the enemy, which earned him his loss of status in 1946. In fact the suspicions against him are based mainly on the fact that the constitutional law of 10 July 1940 was passed giving full constituent powers to Marshal Pétain. All members having voted this law were sentenced to the same punishment. The friend of Maurice Burrus, the Mayor of Vaison la Romaine, Ulysse Fabre experienced the same disappointment at the Liberation. This, added to the nationalization of the tobacco industry and the closure of the Tobacco Factory in 1947, led him to leave Sainte-Croix-aux-Mines and retire to Geneva. Stamp Auctions negotiated the purchase of the Burrus collection for $6,000,000, to be paid in several instalments. A robbery at the firm’s premises took place the night before the first scheduled auction of Burrus stamps. Thieves cut through the iron bars to the window of the room housing the stamps and stole only the stamps with the highest value. A small number were retrieved the following day following arrests but some were never recovered.The robbery led to the exposure of the ponzi scheme, several lawsuits, and the liquidation of Shanahans. He left 150 million Francs to Sainte-Croix-aux-Mines following his death in Geneva, December 6, 1959, at the age of 77 years. The funeral was held at St. Croix-aux-Mine in the presence of numerous political figures from France and abroad, he was laid to rest at the family chapel alongside his parents and siblings. Twenty-one years after the end of the Second World War, in 1966, an important ceremony dedicated to the memory of Maurice Burrus and the abbot Joseph Sautel took place in the heart of the ancient theater of Vaison-la -Romaine in the presence of the many religious and civil personalities. This ceremony became a rehabilitation of the memory of Maurice Burrus and recognition from the French government for his work. Five years later a plaque in tribute “to the victims of barbarity German” is affixed on the front of the local school of Sainte-Croix-aux-Mines. After his death the chateau was sold to a religious congregation and then resold privately. The building is not occupied or maintained and was vandalised during the 1990s. In 1993, this Chateau was listed as an historic monument. In its last financial year 31st December 1995, the Burrus Group recorded invoiced sales (inclusive of production tax) amounting to 525 million Swiss francs before being acquired by Rothmans International the following year. Commenting on the transaction, Mr Charles Burrus, Chairman of the Burrus Group, said: “After 182 years of deep dedication to their family owned tobacco company, the Burrus family consider that it is the right time to step aside in order to facilitate the further development of the Burrus Group”. Mr Charles Burrus died at home on May 10th 2011, aged of 81, following a battle with cancer. I saw Chateau Lumiere for the last time in 2014. At that point, Villa Burrus was mostly untouched with roofing and interior in very good condition however after seeing photos from 2016 onwards it seems that graffiti and vandalism have taken over to such a point that the research of this location and family history will do very little to put this place in a worse position. I can only hope that this property which is declared as a historic monument gets the attention and restoration fitting of its rich history. Saw it just yesterday and really loved to learn more about its history. I hope that someday someone appreciates this property and restores it to original function and beauty. I have followed your documentation and that of Michelle stone and find that more recent posts show this lovely home to be vandalised savagely. Why do some people attack beauty?